You have to hand it to the ancient Greeks- they knew what they were doing, and they knew how to make a play. Who needs realism when there's poetry and music and a deus ex machina? 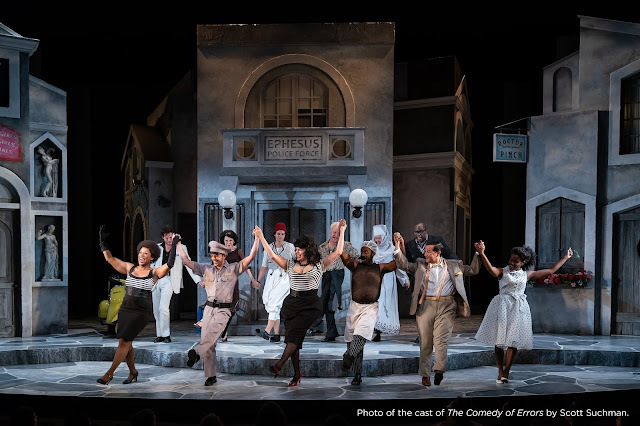 Aaron Posner's fantastic production of Orestes: A Tragic Romp (wonderfully translated by Anne Washburn from Euripides' original) at the Folger speaks volumes to why we still think there's something worth producing in a text over 2000 years old. The evening starts with the character of Electra telling us the story of a few generations of the House of Aegeus. Having seen the text, I can tell you that on the page, it looks like several pages of history lesson- necessary, especially for audiences who don't automatically know an Agamemnon from an Aegisthus, but dull as a brick. On the stage? Holly Twyford's Electra is riveting. You can't take your eyes from her, and you believe that this bloody history is one that matters desperately. Of course, that's Holly Twyford. When is she NOT amazing? Watching her in those opening moments, you start to wonder why the play can't be called Electra. How can Orestes compete? Jay Sullivan is only just starting to make a name for himself for DC audiences, but I know I'm not the only one who was mesmerized by his Dakin in Studio's The History Boys a few seasons back. Trust me- he handles Euripides with the same conviction and ease as he did Alan Bennett, and gives a wonderful performance that holds its own next to Twyford's. Deserving of his own paragraph, however, is Chris Genebach. This is where I have to give a nod to Posner and Washburn- like the Greeks would have done, actors here play multiple roles over the course of the evening. Chris Genebach plays four roles and is a protean wonder. Even with a program in my lap, I had to look closely to believe that the same actor really was reappearing again and again. Every performance is entirely distinct- from Helen of Troy to Menelaus, from Orestes' friend Pylades to a Trojan slave. I cannot do him justice- you have to see his performance for yourself. Now, here's the kicker with Greek theatre. I'm going to be honest and admit that when I read a Greek play, I tend to skip ahead whenever the Chorus starts in. STOP LOOKING AT ME THAT WAY, YOU KNOW YOU DO IT, TOO. But this is why it's better to see a play than read it- because the Chorus on stage is a vibrant, constant presence. They are the opposite of realism, and that's why they work so well. They speak in unison, they speak in poetry, they sing and dance- they remind you of how exciting an art form theatre is when they use every resource available: rhythm, melody, movement, and text. This Chorus, composed of Lauren Culpepper, Rebecca Hart, Marissa Molnar, Margo Seibert, and Rachel Zampelli, are all of those things. They are a pleasure to watch as they operate, existing both separately and as a unit. Once you've seen this play, try and tell me that you didn't get a primal shiver up and down your spine when Washburn's translation brought them suddenly into untranslated Greek for a moment- it's a fantastic moment of theatre. It should be pretty obvious that I was crazy about this production. The cast is fantastically talented. The set design by Daniel Conway is striking (and the rocks are DELICIOUS), and the music by James Sugg is the perfect accompaniment to Washburn's translation. If I've tended to wax somewhat lyrically on about the glories of theatre, it's because this is a production that revels in all those things that make theatre great. As I exited the Folger, I was gripped in that heady feeling of 'My GOD, but I want to see that again,' and as I waited to rejoin my friend, I heard several smiling patrons say words to that effect out loud. Can there be a better recommendation? Please see this show- you won't regret it.